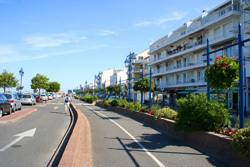 This is simply my favourite resort on the Vendéen coast, and I couldn’t wait to get back there with the mobility scooter and have a real look around for the first time. 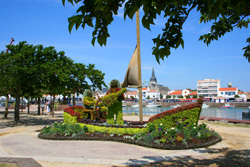 The town is an amalgam of two smaller towns on either side of the river Vie, Saint-Giles-Sur-Vie and Croix-de-Vie. They joined together, appropriately enough, in 1967, which may not have been a great vintage for wine but was certainly a vintage year in my life. We arrived in good time and parked up in the car park just off the bridge over the Vie; we found a disabled place and were overjoyed to find that the parking charges were for the season only and that it hadn’t started yet so the parking was free. We were on the South side of the Vie amongst the many restaurants and cafés so it seemed appropriate that we stop and have a coffee. We sat in the sun overlooking the road and had large milky coffees which were very nice but as usual in places like this they weren’t cheap costing over 5 euros for the pleasure. A tip for those who are looking to economise is don’t drink coffee, beer or even soft drinks in bars and cafés as they are all invariably expensive. Trevor and I normally have morning coffee, a soft drink at lunch and coffee and ice cream in the afternoon, and those things are often as expensive as lunch, so it truly is worth taking a cold bag or a flask, that way you save the cost and you can stop and have your beverage wherever you want. You may not get the same ambience but you will save yourself enough to put towards another day out. Having finished coffee we embarked on the walk that Trevor had wanted to make. 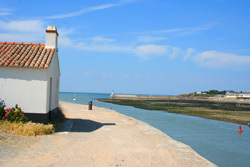 For photographic reasons he wanted to follow the path on the South side of the river then out to the river mouth and along the breakwater to the lighthouse at the far end. 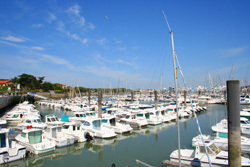 This took in the yacht marina which Trevor thought was becoming one of the largest on the Vendéen coast and which they were even then extending. It was a long walk for Trevor who was suffering from a foot injury which he had sustained the previous day diving into his pool. The walk was very interesting as one could see all of the points of interest on the river’s north bank including the various beaches, one of which has a natural swimming pool at low tide. One can also see the amazing mixture of old and new buildings sitting side by side, I just can’t imagine the inflexible planning officers in the UK allowing development like this. There is a mixture of old almost chalet style houses, stone built castellated buildings and modern shaped glass fronted edifices and everything sits well together and adds rather than detracts from the charm of the place, we could learn a lot from the planning authorities here. The walk out to the end of the breakwater was long but it did afford a spectacular view back to the main beach which stretches South in front of the dunes and then on past the promenade. We were there at low tide and the beach was not only long but wide, however I’m reliably informed that at high tide the beach narrows considerably and your space can become limited. You could find yourself squashed up against one of the local beauties, but with my luck I’m likely to get up close and personal with the beast. 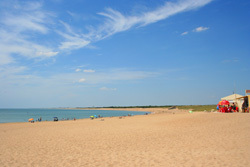 We came back along the breakwater and over the dunes to the esplanade where we planned to have lunch. 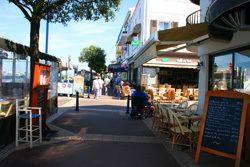 This promenade has changing facilities, toilets (including disabled toilets), cafés, crêperies, bars and restaurants. Behind all of this are the hotels and apartments and behind them the town runs back to the river. All along the promenade the restaurants had dining rooms on one side and tables under sun shades on the other. We looked at all of the restaurants, most offered a formula for lunch which is a limited choice menu at a reduced price. We chose Le Marlow, which seemed to have a predominately local clientele and a menu that suited our needs. My scooter wouldn’t fit in the small space under the sun shades and I couldn’t get into the dining room. The waitress, who wouldn’t win any beauty contests but was nonetheless delightful, moved a table from under the sunshades to the dining room side of the promenade, even though she was incredibly busy, so that I could sit at it on my scooter. We were just in the shade when we started our lunch which was just as well as the sun was beating down. Trevor had his customary alcohol free beer and I had, don’t laugh, a Coke. Trevor had mussels to start, I had a gizzard salad, we both followed that with entrecote I had mine with a pepper sauce, Trevor had the Roquefort sauce and we both ended with Isle Flottant. The overall cost was 29 euros and the review will feature on the restaurant pages. 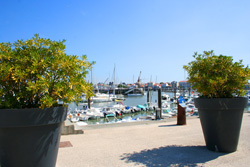 By the time we had finished lunch the sun had caught up with us and we were baking, we left the promenade and walked back towards the river through part of the town, emerging on the river close to the car park. We wandered on across the bridge to the Northern side of the river but Trevor was beginning to flag. If we were going to explore the North side of the Vie, which seems to be the working side of the town with the railway and the fishing harbour, we would need to relocate T2. We came back across the bridge and I wanted to have a quick look at the streets behind the cafes and restaurants, and went off exploring. I could have spent hours meandering around looking at the architecture but Trevor was becoming seriously fatigued, so I cut short my exploration and we made our way back to the car park. We crossed the river but Trevor was hot and a bit grumpy, he wanted a swim, so we abandoned our tour of St Giles and took the corniche past the devils hole which is a rock formation that during high seas funnels the water up in a spectacular spray and headed on out of town. We stopped in the beach car park at Sion-sur-l’Océan and went our separate ways Trevor went straight to the beach for a swim and I wandered along the sea front and then along a path around some rocks, it was hot but there was a slight sea breeze which only helped to remind me why I miss living by the sea so much. I came back along the road and couldn’t help noticing that there were a lot of single storey properties which fronted onto the path that I had previously taken around the rocks. Even though they looked uncared for, one could only imagine what they would be worth. I met up with Trevor hanging his bather’s on the wing mirror of *T2 he was in a much better mood having cooled off in the sea. 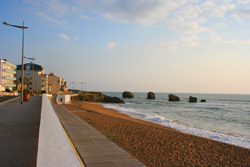 We went to a beach café at one end of the car park and we both had 2 balls of Carte d’Or ice cream in a cornet and coffees, it was expensive but it was good. By the time we had finished it was time to head home so the exploration of the north side of the Vie would have to keep for another day, one that was preferably not so hot and one without the long walk along the breakwater. 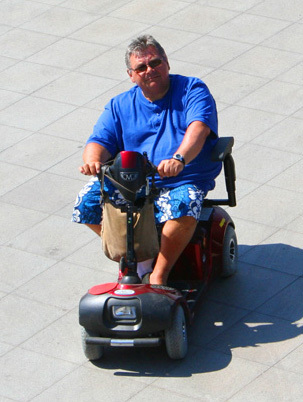 * T2 is Tate's name for his Mercedes Vito van which has been adapted to carry his mobility scooter which he calls T8, all after his childhood hero's in "Thunderbirds are Go"